Another beautiful Sunday day darn sarf. And to celebrate the start of this weekly learny-journey which we are embarking on, I would like to offer a Give Away Gift. How about 20 of them?! Leave an uplifting comment downstairs. 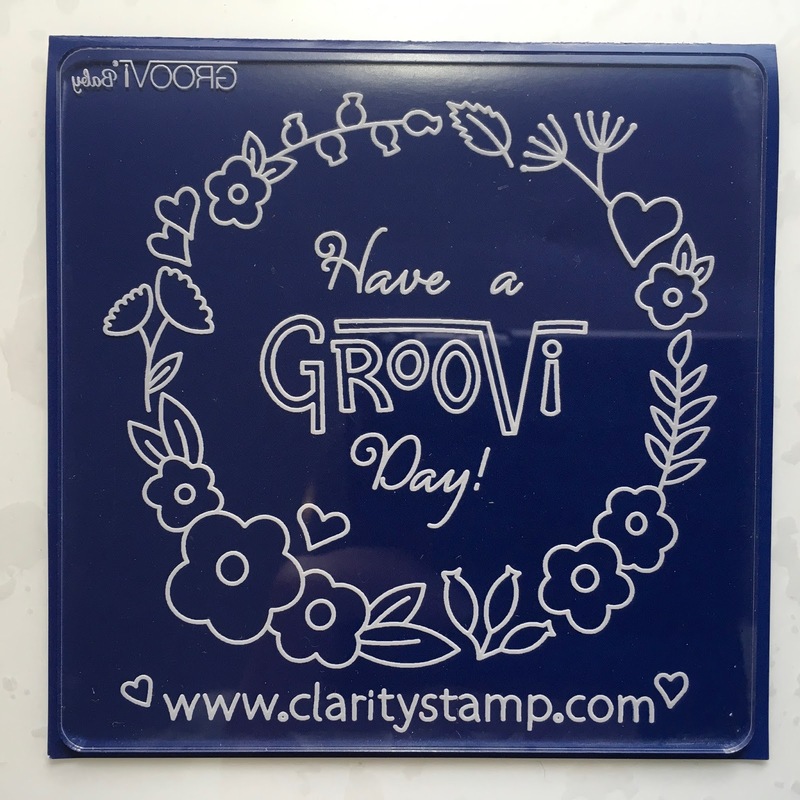 Tell us what you like about Clarity and the Groovi System. And in the meantime, here’s a little step by step. I decided to practice a little before we begin our daily Groovi Meditation. If you’re just embarking on your parching journey, believe me – if you’re following what I do it will be very achievable!! Hahahaha. When starting, start with smaller, bite-size pieces. You need the Inset collar, to hold the Baby plate in the Starter Kit Plate Mate. See? Working from behind, fill the box with the words and a few flowers. For a crisp outline, use the No. 1 Stylus Groovi Tool. The one with no ball at all. Next, use the nested square plate from the Starter Kit to make funky boxes in the frame. Let’s introduce the Basic Grid, the Diagonal one. Use the No. 2 tool, the one with the tiny ball at the end, to make little flowers in every other box. Colour next. Pick your colours from the B-Pencils (oily ones) in your Perga Liner Combo Box. 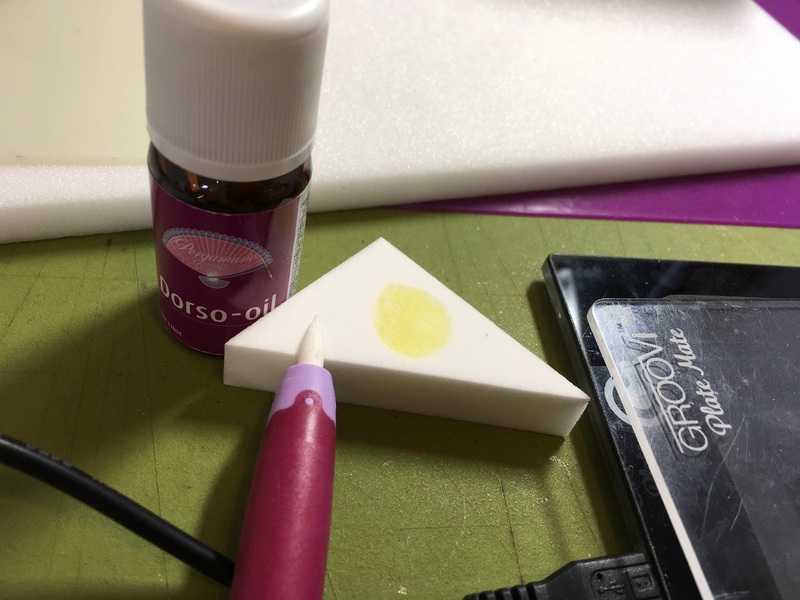 Add a tiny amount of Dorso Oil to a Spot-On Sponge and then dab your Blending tool in the oil. This will blend the colours beautifully and eliminate the grainy texture. Blending Tool?!?!? What is this Blending Tool you speak of?!?!? This is our answer to the cut n dry nibs being discontinued. And they are so much better, because you have a proper pen to hold, and the nibs can be slotted in and out. 3 nibs come with the holder, and you can get packs of extra nibs. Dave, Paul and I have been working on this for months! And now, finally, we are less than a month away from completion and launch. I kid you not – THESE ARE BLIMMING SUPERB. They aren’t just for parchers either. I have been using them for EVERYTHING! Can you tell I’m excited? I reckon these will fly. Can you see the straight basic grid in the background here? This will help me locate the holes perfectly in the little boxes. Once we have done all the inners, let’s do the outside. Again, the straight basic grid helps immensely. 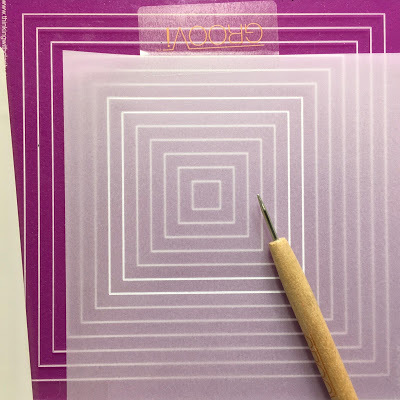 The 2-Needle bold tool fits into the bold grid exactly. Cutting over the waste, picot snip out the inner areas. See how I hold the scissors? Takes as long as it takes. Once I accept that, I actually find the cutting very therapeutic. Cut round the outside next. So happy we have the Groovi Grip to hold the ruler in place! Especially when you’re cutting little slivers like this. Run the Crafters Glue runner along the length of the slivers on the back, and use a pair of tweezers to locate underneath your cutwork frame. Lot of work for a little card. But a great learning curve too. Layer and mount on a white 6” x 6” fold-card to finish. Colouring with pencils and blending with Dorso oil. Picot cutting out little boxes and along a straight edge. Building a background frame with tweezers. You can use any image in the middle, can’t you? – a day at a time – for next Sunday. Tidy room – tidy mind. I had abandoned parching as too time consuming and too easy to make a mistake and ruin a project and then along came groovi! It has reignited the spark for parchiment craft and also cost me lots of money! 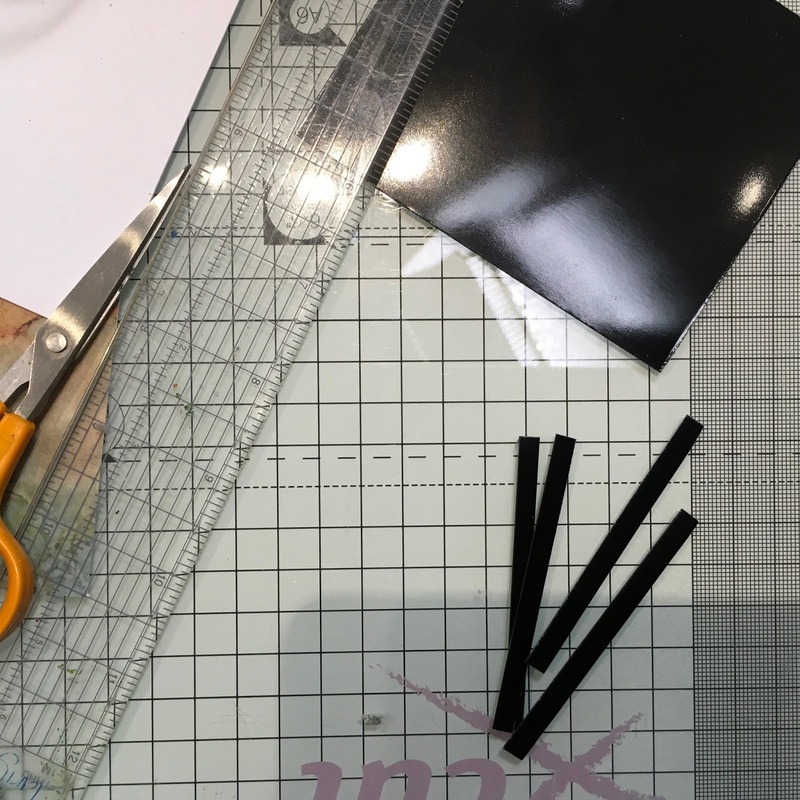 It's been great to find a new crafting interest and the support from Clarity is amazing – so much help so readily available. That looks very beautiful Barb! I love Clarity because of the wonderful products that bring to us. However, they don't just stop there. They provide inspiration and instruction to us, which enables us to produce our own works of art which are greatly admired by our friends and family. 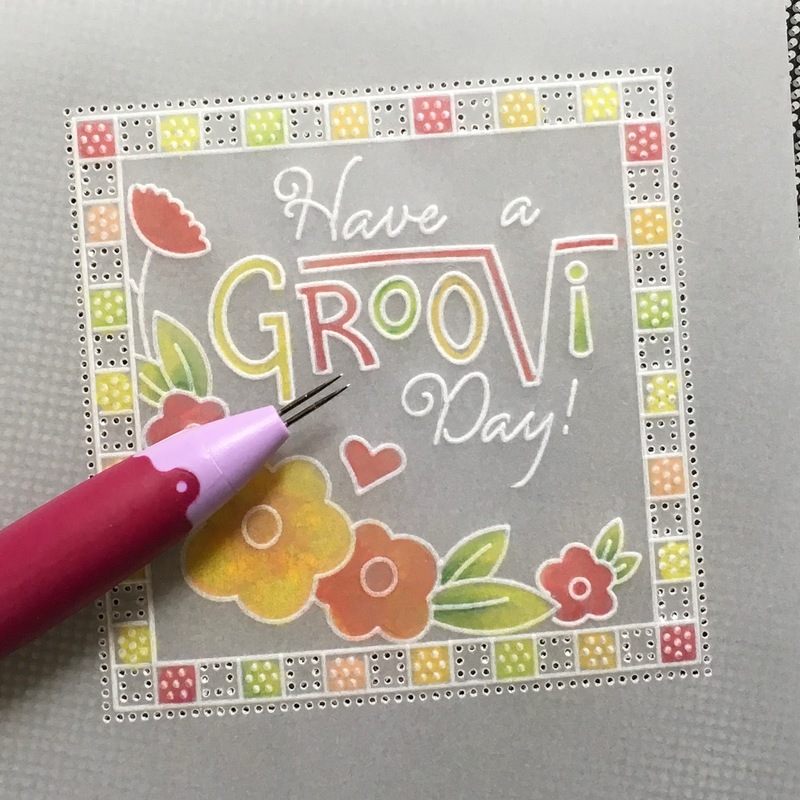 I love Groovi because it enables me to craft – little and often. Because I suffer from CFS/ME I cannot cope with having to get lots of craft things out, by the time I have done that I have run out of energy. Doing Groovy is so relaxing and is another health benefit for me. Thank you Barbara and the rest of Team Clarity – my life (if not my bank account) really improved after finding you! I am over the moon, jumping for joy, thrilled to bits, and every other saying, that you, Dave and Clarity have taken my initial request for the nibs and come up with such a fantastic solution. Thank you, thank you, thank you. Can't wait to purchase it. I love Groovi. Came on board at the very beginning of the parchment journey and am travelling at my own pace. Step by step (lol), bit by bit, I am improving. Thank you for the step by step. I will start on it straight away. 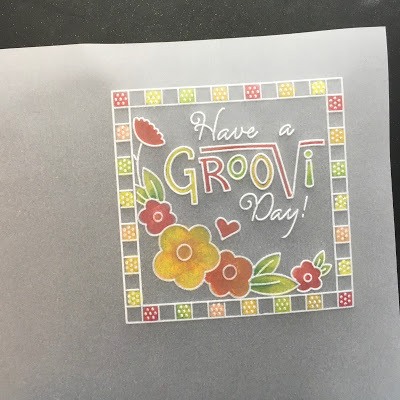 A Groovi a day helps keep the Doctor away. Oh my goodness! Looking forward to the blending tools and my ladies will be too! Fab! 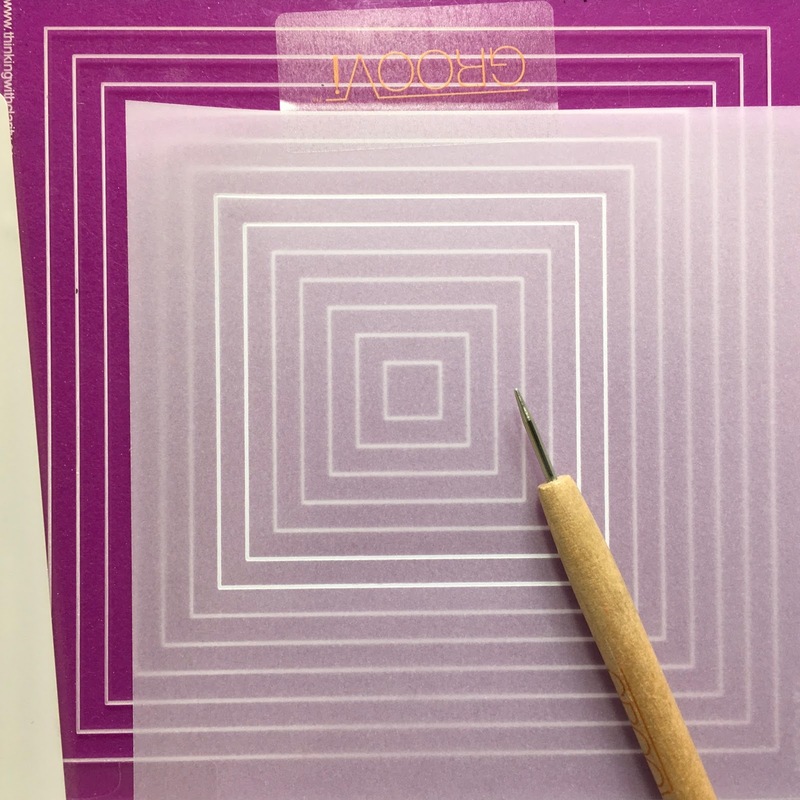 A lovely list of "trad" techniques for a lovely little piece of art. That will please the parchment police errrm— or get up their noses! I love this first project, I have only just started "Grooving" over the last few weeks after many months admiring this wonderful craft. I am definitely going to be having ago at this project with the starter kit I brought! The project idea is great for all levels but especially for novices like myself. I love the Groovi system as I have been able to make projects much quicker than the old pergamano grids and tools (of which mine are the old style). I have several of the metal grids which took much longer than the Groovi plates, I love them and take them with me to my craft group on a Wednesday afternoon, they all see what I am doing, but they mainly do crochet and knitting. I hope to see you at the NEC next month. 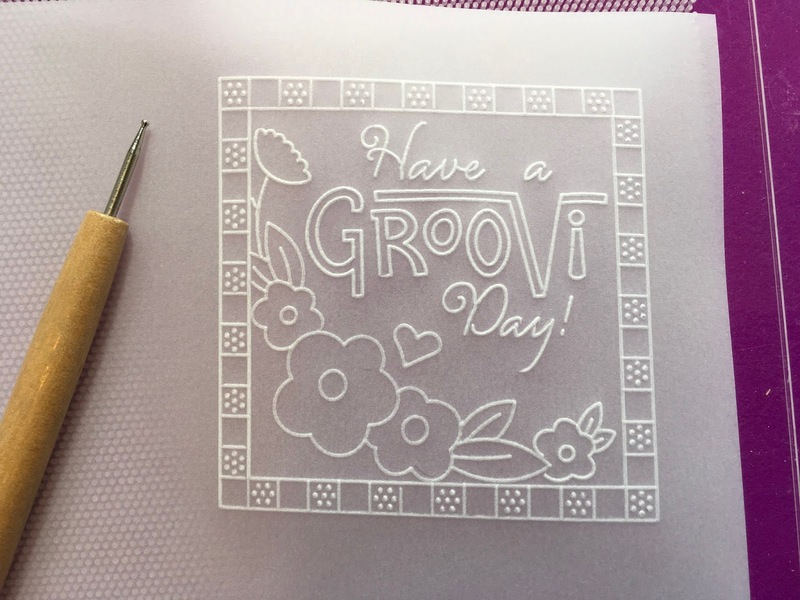 Loving groovi could never get to grips with parchment although tried many times until the groovi system came along ,now a very happy bunny . Clarity exceptional company not only through their many ranges of products but also the retreats , shows and brilliant customer service …. As a sideline here in Edenbridge we have Louise's workshops ..
Lovely little project to get the best creative juices flowing. 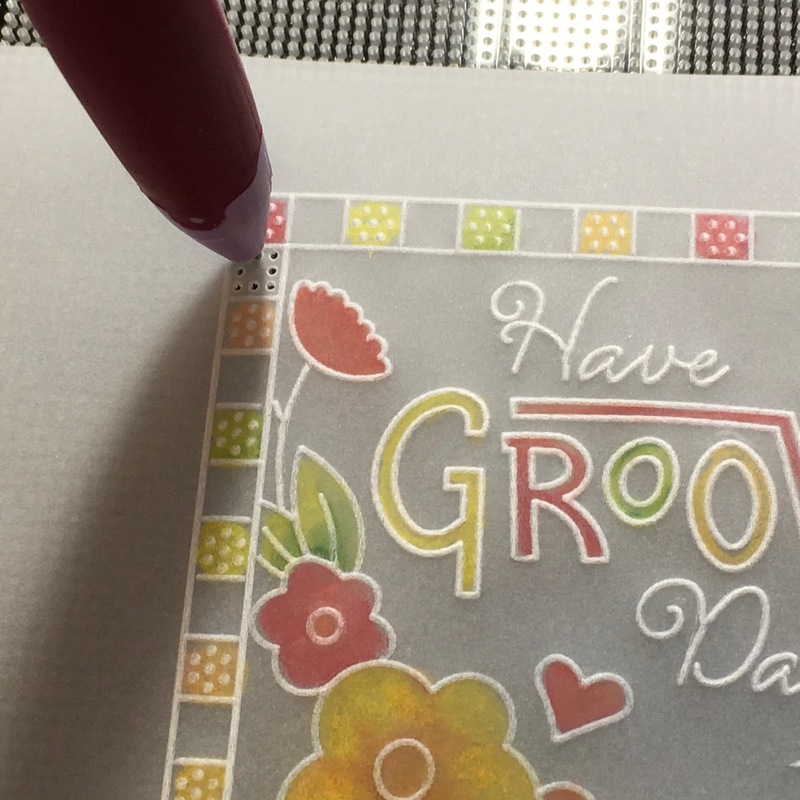 What I love about Groovi is that it caters for everyone from beginner to master parcher. You can make your work clean and simple or delicate and lacy. You can add white work or just go with lots of colour blending (will definitely be after a pen and plenty of extra nibs!). It is also easy to build up scenes from lots of different plates to create something which is creative and unique! Grooooovi! I don’t have the Groovi system, winning would be a great way to start. Thanks for a chance to win.. I say to myself " why do I like Groovi " the only answer for me is " Groovi can help lift a bad day into a good day "
Barbara what a lovely Spring feeling card so colourful. I really need to practice on my square or box lines I keep mucking up the space between the lines. Is it cold in your studio love you seem to be wrapped up against the chill. 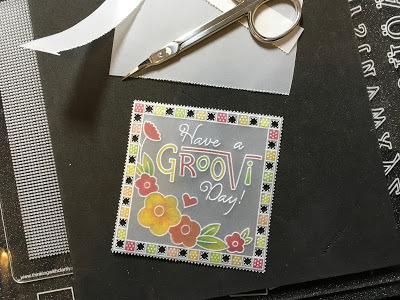 I attended one of the Groovi starter classes at Chesterfield with Josie and learned a lot. Josie is very inspirational I am rather scissorly challenged so am not very confident about the snipping but will give it a go at some point. Love the blog. You have inspired me to have a go at your project my picot cutting not the best but practice makes perfect. 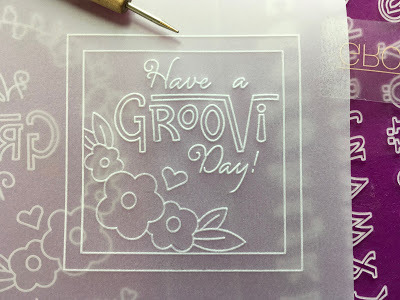 These days I am torn between stamping and groovi as I love doing both!! New to parching, so your blog is inspirational. As a "lone" crafter, it is so useful to have a step by step to follow. Now just need to practice! 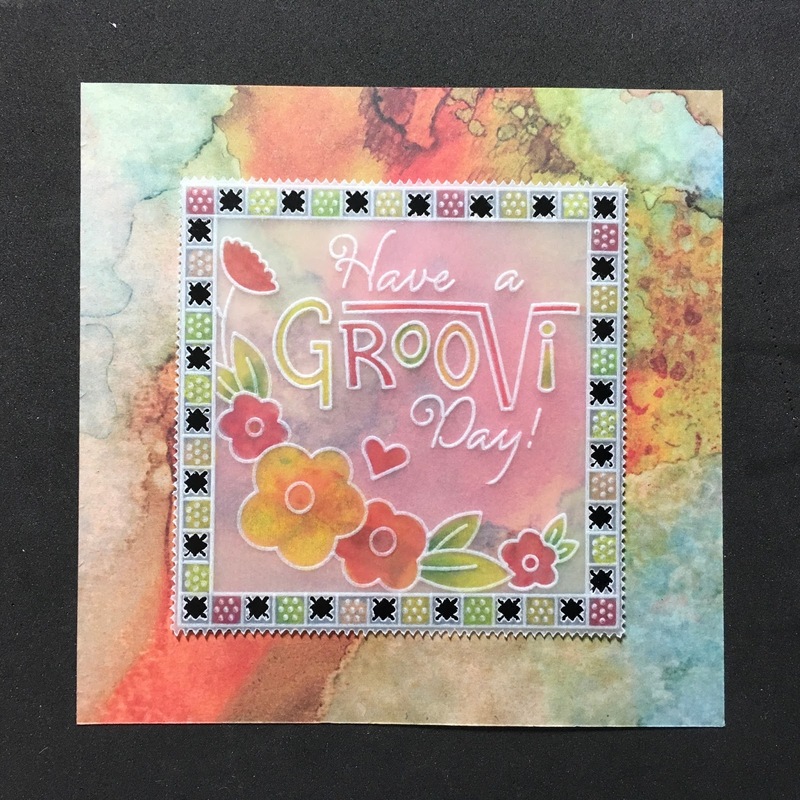 Fab card that covers a lot of techniques. So glad Groovi came into my life – the one thing that is guaranteed to put a smile on my face and help me to relax. Nice to do something that doesn't involve a tv, phone or laptop screen so it gives my eyes a rest too. I find myself dreaming up card designs or elements wherever I am. Innovative and new…go on try it…you'll be hooked when you do! Never be a poet, but love my GroovI. ..was a trad parched for many years then gave up but like so many Groovi has rekindled my love of a beautiful craft. I'm busy slowly working my way thro' Linda's book relearning some of the trad techniques and thoroughly enjoying it. Looking forward to the pens/nibs another great idea and the chance to win that lovely little plate…fingers crossed! Afternoon Barbara! Great project….nice and bright like the day. It's still very very cold though so an afternoon of Groovi is perfect! I think that blending tool will be dropping into my basket as soon as it possibly can! Have a lovely relaxing afternoon and evening. Hi there, what a great wee plate just right, love the design. 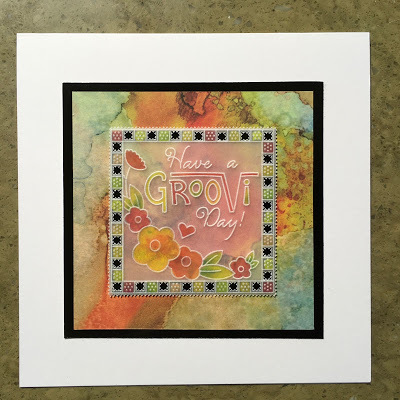 I would love a chance to win – I think the best thing about the Groovi system is that it works for anyone with dexterity problems just follow the groove and hay presto its done. The small plates work so well with doing those wee projects but can be incorporated with the larger ones. Love my Groovi, I don't do much but LOVE what I do. I look the look of the blending pen, so have added it to my shopping list and the new baby plate looks lovely, would love to give one a caring new home! You've done it again with the black strips – thought of something I wouldn't have in a million years!!! 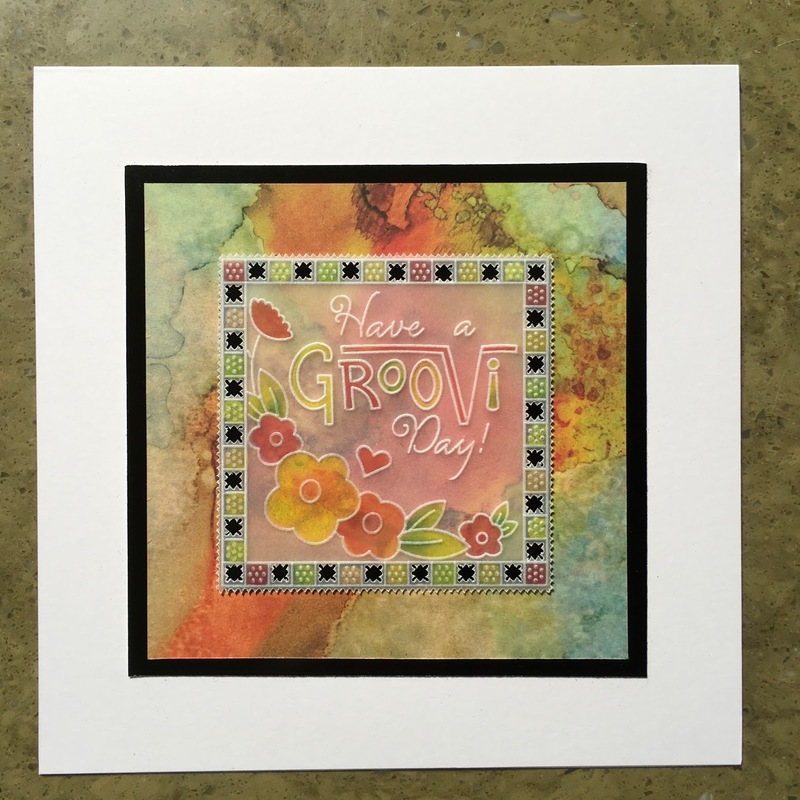 The word Groovy originated in the 1920's jazz culture – the groove (rhythm and feel) of a piece of music – and the response felt by the listeners. Wikipedia defines it as cool, excellent, fashionable or amazing depending on context. So many reasons why I love Clarity and the Groovi system. The main one being that we are learning together and I feel such a part of the Clarity family that I was sorry to have missed the opportunity to offer you our homemade chutney to go with your pork pie when you visited Melton Mowbray. I love the thought that goes into each design and that accessories are truly useful and not an unnecessary money milking exercise. If it were not for Clarity I would never have tried parchment, have several friends over the years who have tried to get me interested in parchment but I always thought it was too hard, too fiddly but now I am up and away, what a great system and always more ideas on the way. Great blog post as always, I don't go a day without reading it. I love Groovi and was impressed when it was very first launched. I have depression and anxiety issues along with other health issues like so many others. I find Groovi a wonderful way to switch off from the craziness in my head and allow my body to truly breathe. I don't have that my plates but I'm club member and look forward to my happy post each month and have never been disappointed. Just love this first of hopefully many Sunday Groovi projects. It will mean that everyone will be able to achieve something by following the step by step pictures. 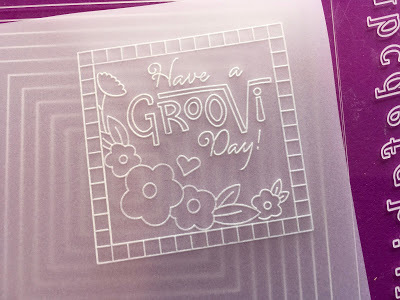 Good luck to everyone who has posted a message for Barbara as 20 of them will win the lovely baby Groovi plate. Roll on Wednesday when all will be revealed !! 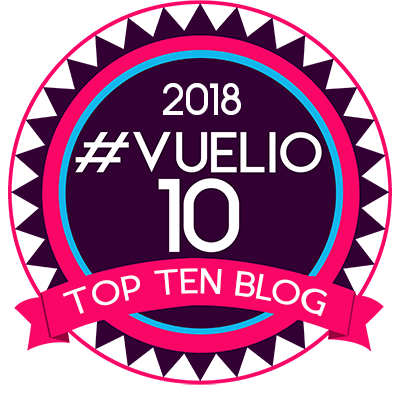 Thank you Barbara for another great blog post. Afternoon Barbara, it's sunny but cold up North, so staying right here ! Groovi keeps me sane, what's not to love about it ? I am certainly going to need the new blending tool ! Fabulous little project today, love it! The new baby plate is gorgeous and as for that blending tool – well one will definitely be falling into my basket as soon as they are released ( along with spare nibs) ! Absolutely fabulous idea. 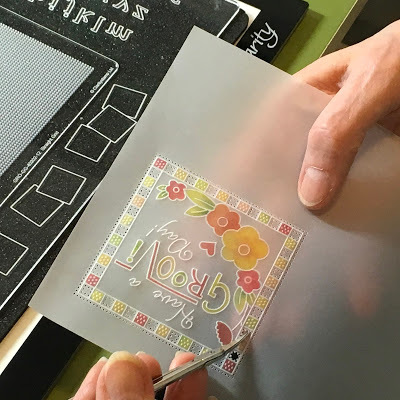 Great little project, with clear to follow instructions – I look forward to playing along with this and future weekly projects. Clarity is the team and product range that teaches you to say "I can". I remember, a few years ago, admiring a sample of traditional parchment craft that was on display in a local craft shop, only to be warned off even attempting such work by the assistant because it was far too difficult! Then along came Groovi and, although I was initially reluctant to dip my toe in the water, remembering that previous discouragement, you have gently and patiently coaxed me in, with your constant reassurances that anyone can get good results with this system. The New Design Club was the clincher for me, with its baby plates that carried the promise of reducing the artwork to a less daunting, more manageable size. So now, instead of seeing a beautiful example of parchment craft and believing that it's screaming out at me "impossible", I have come to realise that it's actually saying "I'm possible"! Thank you Groovi, thank you Clarity team, thank you Barbara! I love Clarity! A company that’s always so inclusive of its friends and customers. WOW such a cute little piece of art ! I hadn't even heard of parchment work until about a year or so ago being in the USA. But when I saw it I fell in love with the laciness of it and I searched and searched and low and behold I found YOU on YouTube. I also found Groovi. I didn't think I could order straight from you for a while. But got a few things from a gal here and some off Amazon. But now that I know I belong to all 3 clubs and order as often as I can. I am hooked. Thank you so much for Groovi is so fun and relaxing I can get lost for hours in the process !!! Hi Barbara, love this step by step, have picked up a few things which will help me going forward . Wow just love the new blending tools which are soon to be released i do think they will be a must. 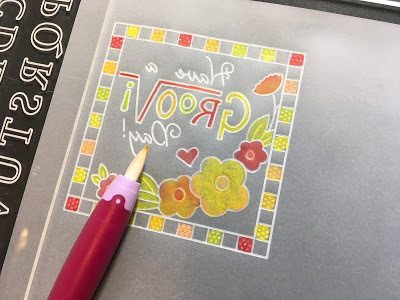 Love Clarity even if you are only a started in any of the crafts ( Stamp ,Stencil or Groovi ) there is always some thing to learn and that is what Clarity is all about . Talented team and great customer service + an amazing Boss not for getting Dave and the rest of the team. Love making Parchlet Treasures as well as bigger Groovi projects. The process is so relaxing and rewarding……time well spent! 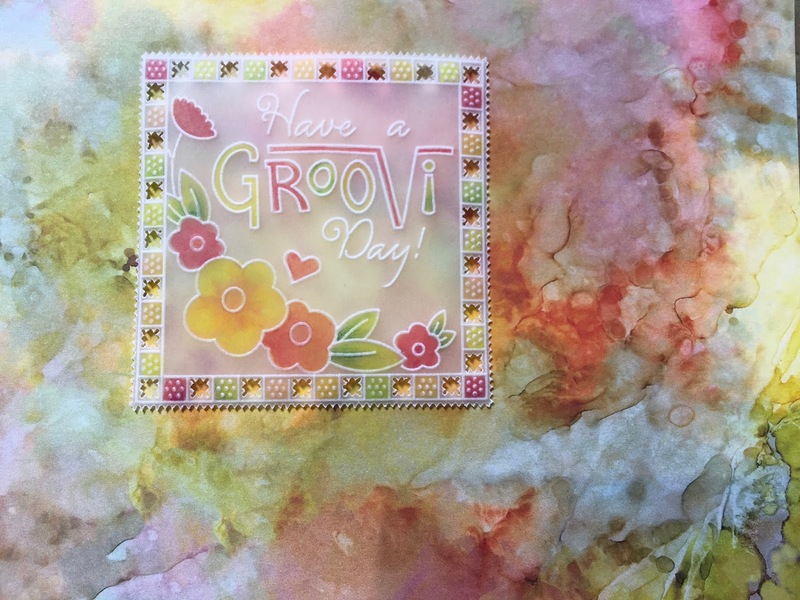 We all need to take some time out, forget all the stress and just be in the moment, and playing in Crafty Corner with the wonderful Groovi system and using parchment techniques is a wonderful way to lose the stress and create something beautiful. Then in a moment of Clarity the stamps can join in to create a union of techniques that blend so well together. In it! Hoping to win it! 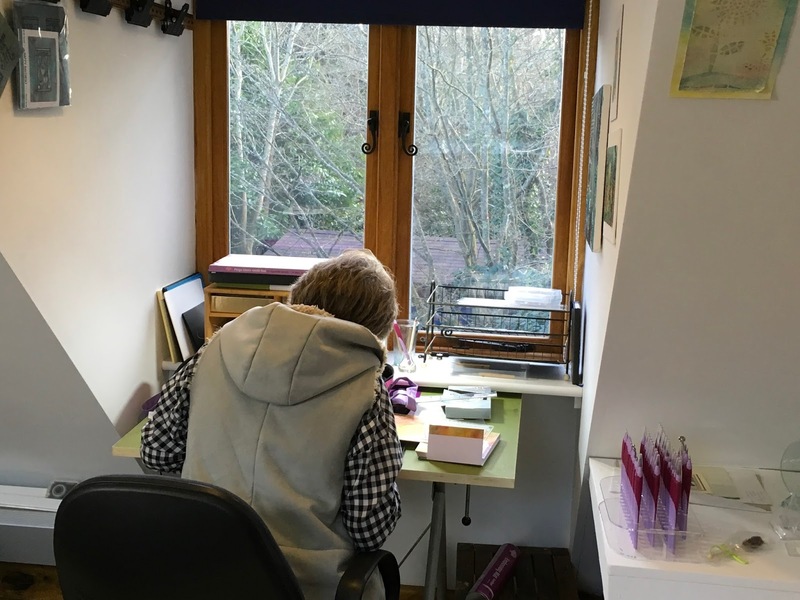 It's been a beautiful sunny day here too, the light was streaming in to my craft room earlier while I was making cards for upcoming birthdays. 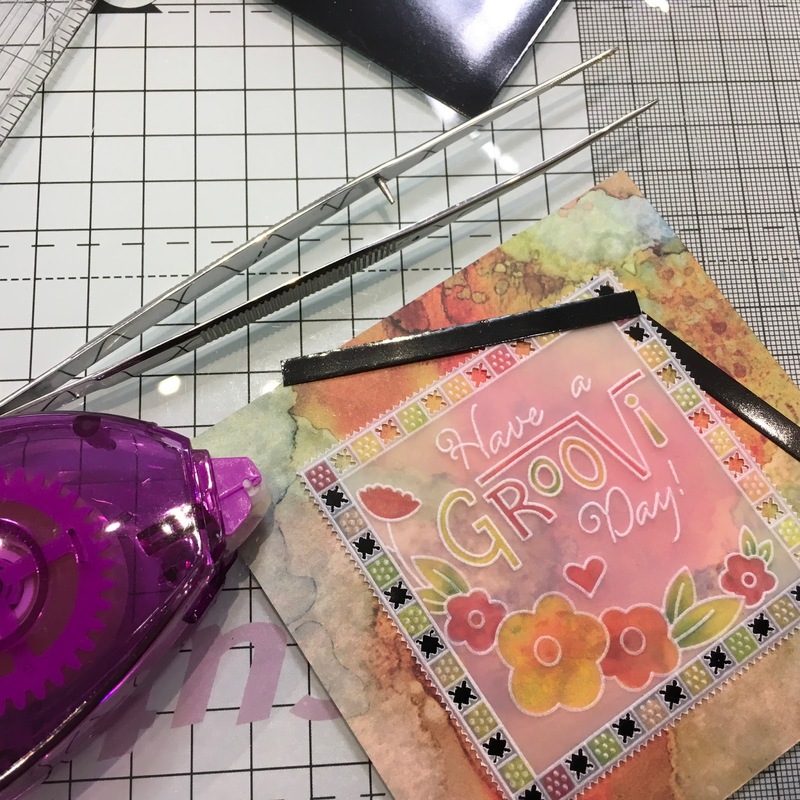 Groovi is my go to method of crafting these days, can't see me ever getting tired of it. I have been with you from the start, I have so many plates I couldn't even count them. Every time you bring something out I have to have it. Just keep bringing plates, projects and inspiring programs out and I will just keep buying and following you. Thank you Jacqueline. We went out to Stow today, to meet some old friends for lunch. 45 years since we met as next door neighbours in Lancashire, emigrated to South Africa and then returned home. It was lovely to catch up and a beautiful day, even though freezing cold. We had a great pub lunch too! I am looking forward to getting my hands on the blending tool, as it is such a great idea and will make my colouring look so much better. I can’t believe the work I am producing since I started on the Groovi journey. It is far, far from perfect, but considering I did not have a clue about parchment craft just over a year ago, I am chuffed to bits with what I have achieved. Clarity, what better name for such superb stamps and a fantastic company. 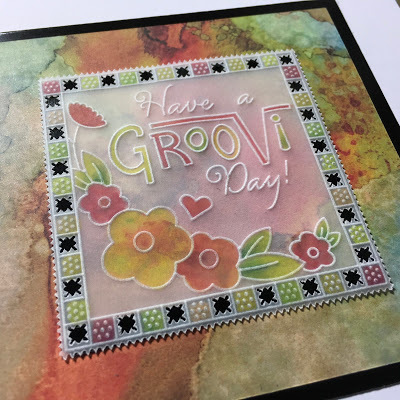 The groovy system "its groovy man" it has given so many people of all abilities and ages the opportunity of doing parchment and the opportunities and designs just keep coming. I embrace the day I found Clarity Stamps and Barbara, I do love stamping that's where I started but I absolutely love Groovi and am addicted to it like many others, I have most of the plates and now they're all sorted in Clarity folders, so easy to find. It's the best thing ever for me as it takes my mind away from any worries I may have. You get such good results even without the piercing and pricking and feel like you have achieved something with relative simplicity. Wow and what a great prize for some lucky winner too. Good luck everyone. Groovi is great because you can keep it simple or make it challenging by combining old and new techniques and different mediums. It has made Parchment craft available to all, regardless of age, gender, ability or skill level. I love Clarity and Groovi because they're so mix n match(able). Like Pick n Mix in a sweet shop you can choose and combine the products to suit your own personal taste. It's all about choices – your choices. There are no rules, just fun to be had. Lovely project Barbara. Sunday is my day for Groovi. It helps clear out the brain mess from last week and gives a calmer start to the new week. I have been parching for a long time and am a member of the guild, but all the white ink drawing slowed me down. Groovi has reinvigorated my enthusiasm and the projects keep flowing. Thanks to all the team for he super inspiration. 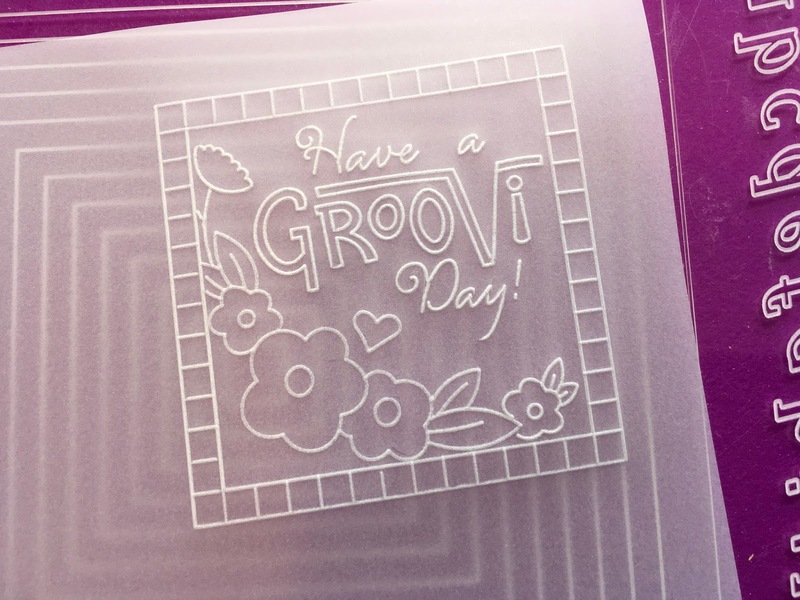 I love the precision and meditative nature of working with Groovi plates and parchment. And, of course, I love the beautiful results! I find that groovi brings me back to me and quietens my mind when everything is feeling overwhelming, as it has been for the last few months. I am thankful that you and the design team give so much inspiration and greatful to Emma Burns for the time she has taken to develop my skills. I know that many others also think this. Lovely little card. I only started Grooving at Christmas having had the starter kit as a present. Now I'm totally hooked. I'll definitely be following your projects and giving them a go. 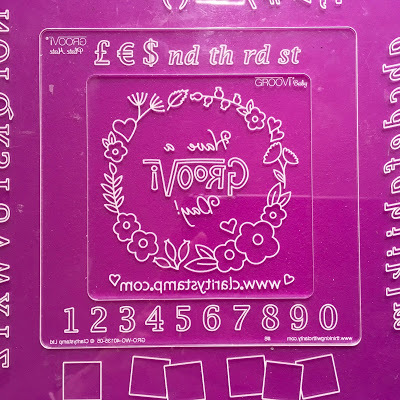 You got me started on stamping those many years ago, then you got me stencilling and now you’ve taken me further out of my comfort zone grooving. Where else are you gonna take me on my journey into card crafting? I have really enjoyed our journey and look forward to many more years with you and the Clarity Team. Marriage of Groovi & traditional parchment together. 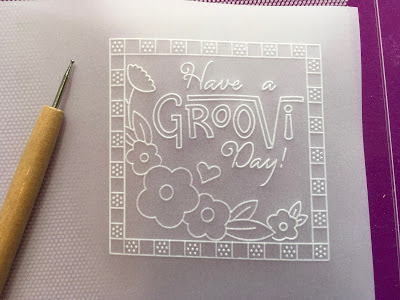 Groovi brought the basics of parchment craft & then paired it with many of traditional parchment craft techniques, so like a happy marriage it takes time, patience & love to get to enjoy this beautiful craft. 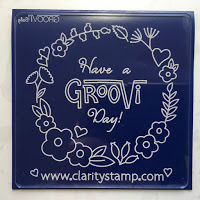 Every day is a Groovi day now that I have found the Groovi system. I used to parch long hours before the Groovi system came along and it was laborious, no wonder I lost interest. 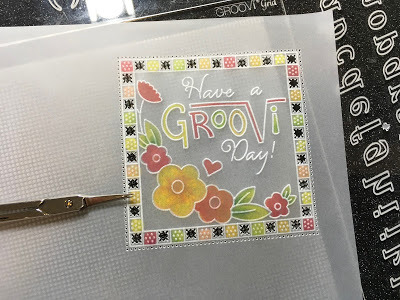 I love parching now and the results are stunning and give confidence to try more and more different techniques with stamps, stencils, inks etc.etc. Well Barbara what a brilliant Groovi project I may have to give it a try that is after I finish playing with my owl plates.. The weather forecast is I bit bleak for this coming week the beast from the east as they call it brrrr hope it does not affect my trains for Sunday to Tunbridge Wells. So it’s perfect weather for locking myself away with my ever growing Groovi collection and just taking time out from the daily grind and loosing myself in the moment that is Groovi. 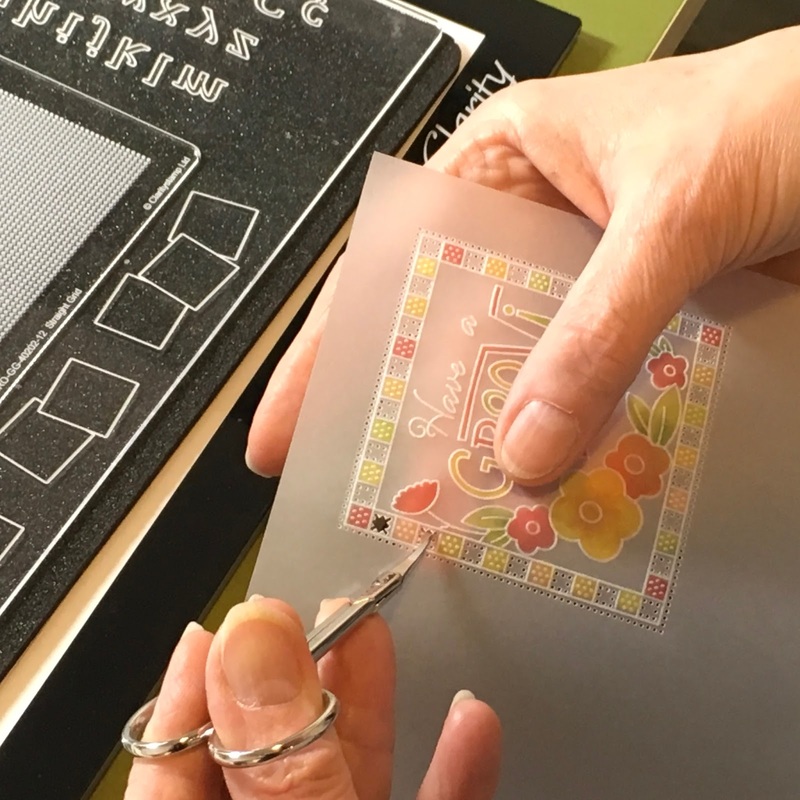 I have to admit I did not think I would be able to produce a parchment piece I had tried it years ago without any success but now Groovi has given me and thousands of others the skills and confidence needed to achieve a wonderful piece of artwork. 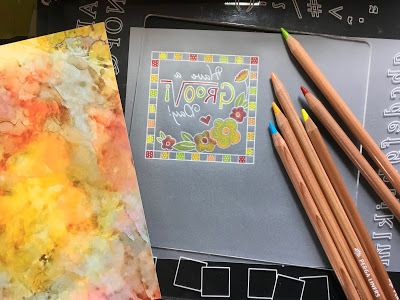 I like a lot of others here on the blog will be in the que for the new blending tool I have to say I have used loads of paper stumps in an attempt to blend my colours this looks like a bril bit of kit. What a lovely project, very achievable and very effective. I love Groovi because I can pick it up for a little while and then come back to it when I have time. I must try to do some smaller pieces like this as I sometimes feel overwhelmed when I get too ambitious. At the moment I am working on a wedding dangles card. Like many others have said, I tried traditional parchment years ago but was never happy with my tracing and a lot of the patterns seemed old fashioned. Groovi has brought parchment craft into the 21st century. What a beautiful small piece of artwork you've made for us to craft along with Barb. I love Groovi, you can loose yourself in it and time flies by without you knowing. I've tried traditional parching but made so many holes in it that shouldn't be there. It's a craft the can be taken to many levels, I'm still fairly basic with outline, a little bit of whitework and basic colouring but I aspire to beautiful picot cutting rather than mouse nibbled work! I'm going to try this little piece though, it won't hurt to give it a go and who knows I might stay on the groovi train and try the cutting out in the squares, Thank you Barbara and the Clarity team for bringing us this wonderful system and for your really helpful blog and YouTube videos. Hi Barbara. 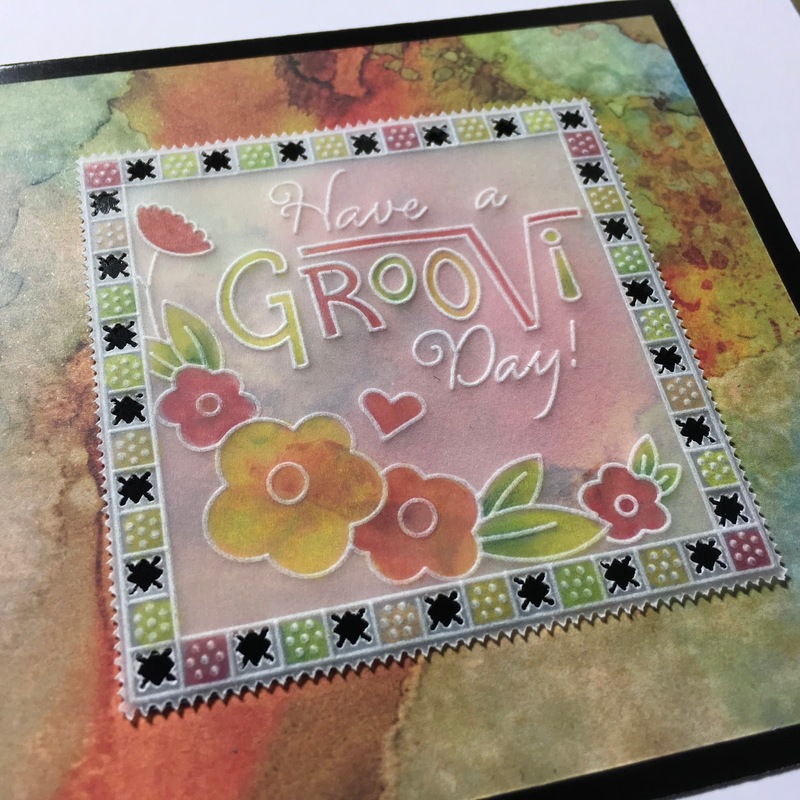 I have loved groovi since the day you made me a sample, which I still have, at the show at port sunlight a few years ago. At first they wouldn’t let my friend and I in as we didn’t have tickets. So glad they did in the end, as I have so enjoyed groovi, and your lovely stamps ever since. You are a wonderful teacher, this lesson is wonderful and a great card at the end. Also enjoy the. You Tube lessons as well. All so helpful. Keep up your inspirational blogging and videos. You and your team are stars. I love that I can pick Groovi up and do some when I have time, and put it down if I get interrupted, and it's all still there waiting for me when I get back. No jumping off the lines, or wasted parchment. I love that all the plates complement each other and can be used for so many different designs. I like the ideas and the inspiration I get just from looking at the plates, stamps or stencils, never mind the art work from the Clarity Team. I love that Clarity is on OUR side, and isn't just about making as much profit as they can out of us. They really like their clients! 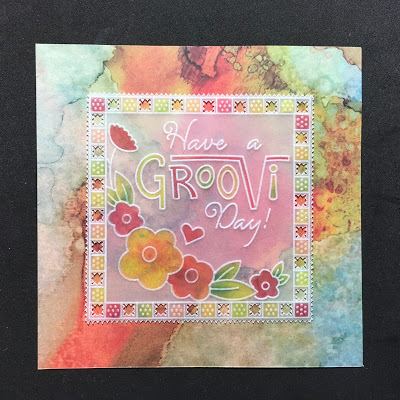 I love that Clarity now combines stamps, Groovi and stencils – my three favourites things! And I like Barbara, the woman who pulls it all together and makes an awful lot of crafters very happy. I'm one of them. So thank you! and found that, for me, it was then a no-no. it looked like I'd worked with a hoe! then, one day, a chance find restored me to heart. 'cos 'Groovi' was on; what a huge revelation! A great way to make a new start. and 'Grooving' provides me with hours of pleasure. Barbara Gray – you're a National Treasure! I have followed Clarity for many years since you did your lessons on tv clarity ,I have found clarity to be so helpful and will go that extra mile to help its customers .when the groovi came out it opened another way to craft its a wonderful piece of crafting kit I love the members club as the groovi are so easy to manage been small because I have rhumotiod arthritis as many other complex medical health problems one is CFC/ME also depression and crafting helps me cope with them but the groovi is so good as you can do a little leave and go back to it there are some amazing plates that you can mix elements of each you don’t have to use just one plate I don’t do the picot cutting but the cards I can achieve just with the basic groovi are always loved by the people I send them too .so if anyone is wondering if it’s for them join the club and you won’t regret getting it plus it’s so lovely to get a little club gift each month and the inspiration that comes with it . Hi Barbar! Well you just can't stop yourself once you get going, can you? I just love making new things with the Groovi. It's amazing how many people can all sit with the same plate yet we all will make something different from the same plate. What a lovely little project. Starting small is such a good idea. I am so pleased I discovered Groovi. It has enabled me to take up a craft that I didn't think I could do. I get lost in the groove and I find it so relaxing. I learned traditional parching but had difficulty tracing; Groovi has taken that issue out of the equation. All the tips and tricks from demo's, you tube Tuesday and your blog posts have enriched my parching journey. I love Groovi and am amazed by your enthusiasm in learning parching along with your customers. I just recently in the last year found parching and Groovi. I am raising my special needs grandson and this helps me in my spare time to get "lost in parching. It's very relaxing after a stressful day. Here in Ontario, Canada not too many have heard of Groovi, which makes my handmade cards even more special. 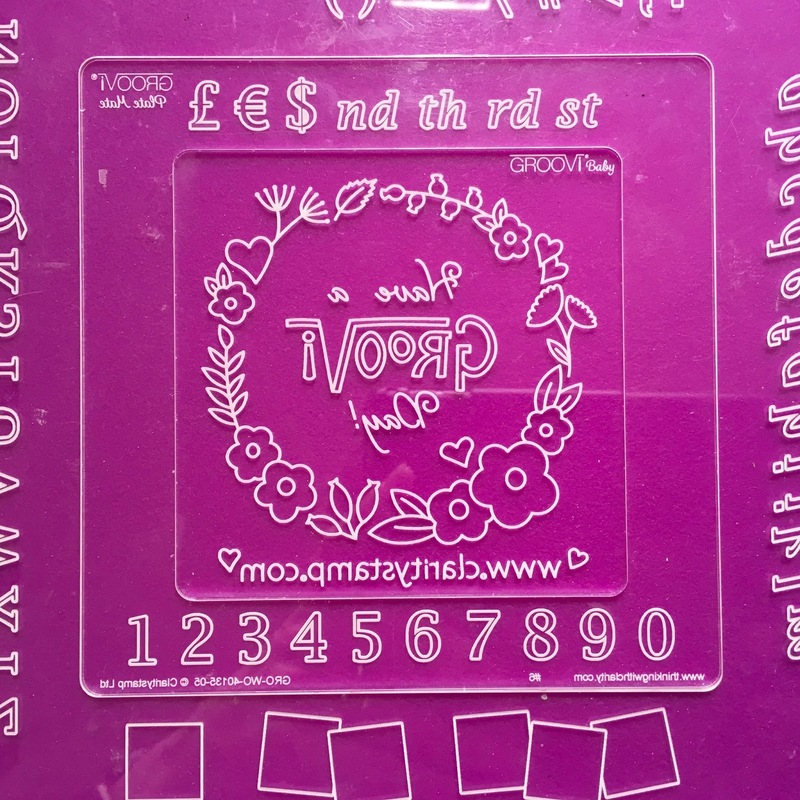 I love the Groovi plates and have just started my journey.. I love your blog and inspirations..and look forward of expanding my collection..
You and your team have made so many people's day. Groovi has made parchment craft Groovi! My first ever visit and I came on a really interesting day! This is so cool! I can’t wait to see more and maybe give it try myself….thanks so much. I am enjoying your blog so far! Aw! She's right you know. I don't think a session at our art and craft club goes by without a mention of your inspirational ideas. This morning it was shrink plastic using clarity stamps. Great fun had by all! Always go back to Groovi when I need time out. I was so inspired by the new plate that I did the rose in the frame with the cut outs straight away. I was so chuffed with it! I love Clarity because of the connection it gives me with my Mum. Mum and I have always shared our love of crafting, and with that, our love for Clarity. When I still lived at home, we used to watch the Sunday shows together, and would look forward to it each month. We'd also go together to shows and when we got to meet you, Barbara, it was just wonderful. Now I've moved away from home, we still frequently text each other to ask if one of us has read your blog for the day, or if we're watching your shows, or even if we have bought anything in the sale. It's just another lovely excuse to get in touch with each other. As for Groovi, well, I don't actually own the full Groovi system (I know, shock, horror!) but I do have the baby plate mate and 2 years worth of the Groovi club plates that I enjoy making use of. I haven't been able to renew my subscription for this year, so I'll be crossing my fingers for this giveaway as a new plate would be lovely to play around with, and I could share it with Mum next time I visit home. Thank you to all of you at Clarity for all that you do – you run a fantastic company that will always be mine and my Mum's first love in crafting. (This is a re-post of my original comment as I made an error and there's no edit function so I had to delete and post again). Groovi has opened up an entire area of creativity for me. I always admired the parchment work others did, but it was beyond my skill level and I didn't have the patience to put in the time required to change that. Then Groovi came along and I am thrilled at the addition, and addiction, it has added to my crafting. Although I am just starting out, I am pleased with the results. I watch every show and video I can. Barbara,thank you so much for all that you and your team continue to do to elevate our crafting. Concentrating on Groovi takes my mind off everything else going on in my life. It gives my mind a rest and makes my soul happy because I can produce lovely cards, etc. I always thought that parchment work wasn't for me but the Groovi system has given me access to this beautiful art. Thank you.